January 27, 2015 /1 Comment/in Informational /by Lindsey P.
Finishing touches are one of the most important parts of the room, and interior designers everywhere know that lighting is a great way to instantly turn a space into a masterpiece. From modern and sleek to traditional and dramatic, unique ceiling lighting features are not only functional, but also stylish and serve as the uniting factor of a room. Forget the gaudy and dusty chandeliers from your grandparent’s house – modern chandeliers are all about lighting up a space with unique style and elegance. Aside from our collection of metal and glass ceiling lights, our unique line of made-to-order metal chandeliers can be a showstopper in any space. Chandeliers and pendant lights make a particularly big splash when used in kitchen spaces. With quality you can trust, like commercial-grade fixtures for indoor and outdoor use, there is a perfectly unique light fixture for any space and any style. Rustic styles can be homey and inviting, especially when done in an unexpected place, like an office or waiting area. 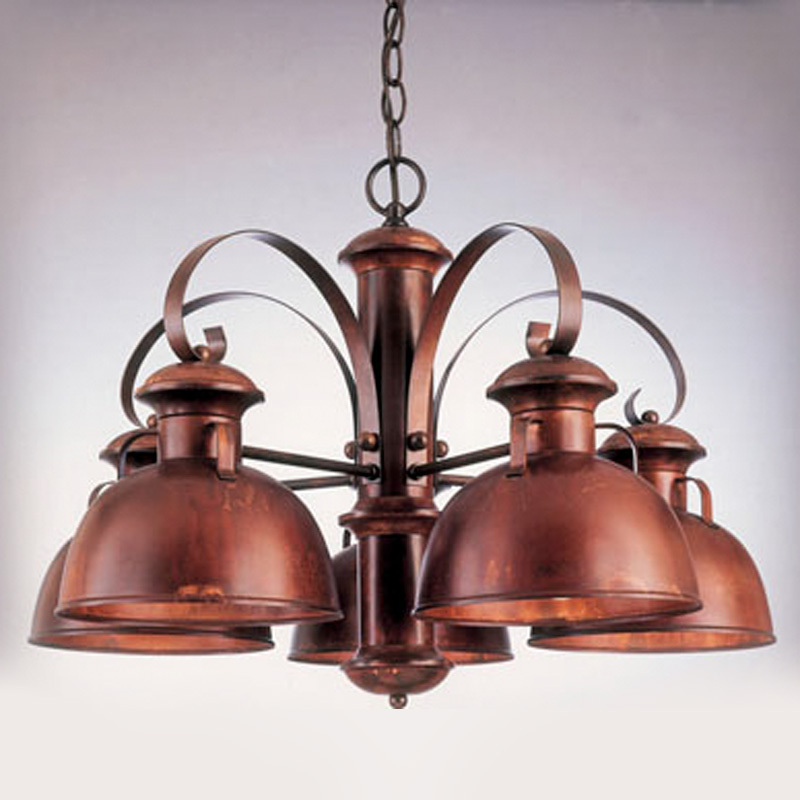 Complete the look with one of our charming barnlight chandeliers. Available in a variety of sizes and with three or five shades, these pieces can draw the eye to the ceiling and leave a lasting impression. Don’t just add a few rustic accessories and call it good – really sell the design theme with these specially designed pieces. 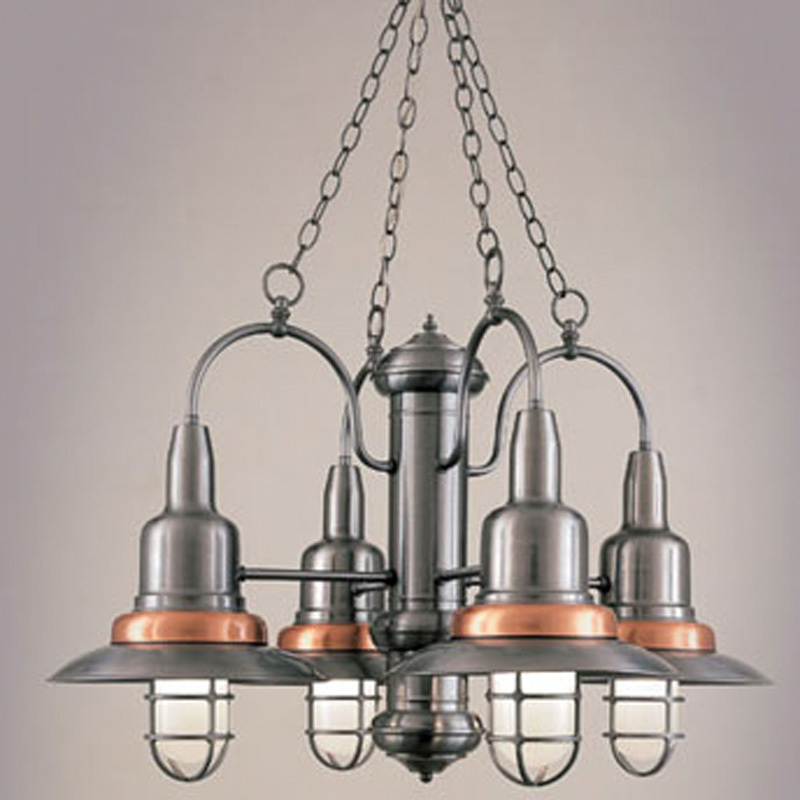 And with the unique finishes and salvaged pieces, no two fixtures of this bronze chandelier are the same, meaning the lighting can be as unique as each client’s space. Accentuate the interesting textures and edges of an industrial space with our warehouse chandelier, the perfect combination of hard industrial style and classic elegance. This beautiful modern chandelier works well over a dining or meeting table or in the lobby or waiting area of an open space. Hanging light fixtures add another design dimension to a room and can be a great way to incorporate the style into all areas of a space. Add an airy touch of whimsy to any space with our seaside chandelier. Available with frosted lights or clear bulbs, this unique chandelier brings a sense of lightness to the room. This piece is perfect if you’re in need of kitchen lighting ideas, as it can balance out the weight of countertops and heavy appliances. Put it in a space with natural light to accentuate the beauty or use it to bring in a sense of openness to an interior room. Every client and every space is unique, and that should be reflected in the purpose and style of the room. Tie it all together and give your client the one-of-a-kind piece they deserve with unique chandeliers in every style. To shop unique ceiling lighting fixtures Click Here or call toll free. Questions? Comment below and I’ll respond ASAP! January 22, 2015 /0 Comments/in Informational /by Lindsey P.
Ambient is a hidden source of light that washes a room with an even glow with little shadows. It is the general illumination of the room and sets the predominant light level and mood. This is usually achieved with lamps that direct the light downward such as wall sconces, chandeliers, or ceiling lights like our 18″ Ceiling Lights with Contemporary Eyelets. You can use a dimmer to adjust the level of illumination you want for specific occasions, such as when hosting a dinner party where a darker setting is favored. This is exactly how it sounds like: it is directional lights used for doing specific tasks such as eating or reading. When creating task lighting, it is important to position the light fixtures to create more contrast. If poorly positioned, this could cause contrast reduction which results in a loss of visibility. You want to use task lighting over kitchen counters where food will be prepared; seating areas such as the dining room table where food will be eaten or living room couches where books will be read; and home offices where paperwork will be done. Pendant lights are great for achieving this such as the 6″ Convex Cylinder Pendant Light with Vertical Lines Pattern. Accent is used to draw your attention to a particular, noteworthy object, such as artwork, plants, or bookcases. If you have a large painting or mirror, frame it with two wall sconces. 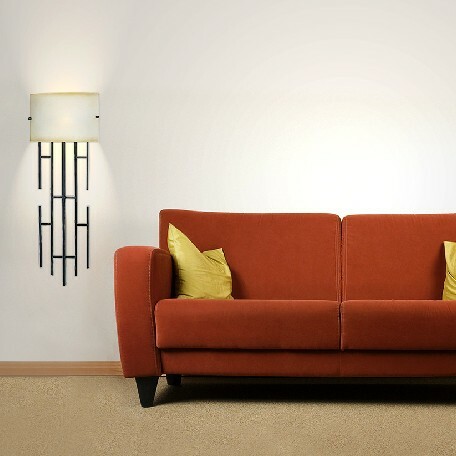 You can never go wrong with the 12″ Contemporary Cylinder Wall Sconce which fits any room’s style and decor. Are you more enlightened now? Consider all three types of lighting when planning the layers of light in your room lighting. Usually, you want to start with the ambient lighting first, and then build up the task and accent lighting. For rooms that are heavily task-oriented, however, you can focus on the task lighting focus, and then build the ambient and accent lighting. Similarly, for rooms that are used like an art gallery, such as hallways, you may want to consider accent lighting first. September 6, 2014 /0 Comments/in Informational, Lighting Inspiration /by Lindsey P.
Pendant light fixtures are truly universal because they are easy to install and can be used virtually anywhere. They come in various shapes and sizes, but you know them by their one similarity: They hang like a pendant from the ceiling. The kitchen is a common place to hang pendant lights, especially over the kitchen island or for use as modern lighting by hanging them over the kitchen table. How many lights should hang over a kitchen island? Take a look at this guide to help you decide how many to purchase. 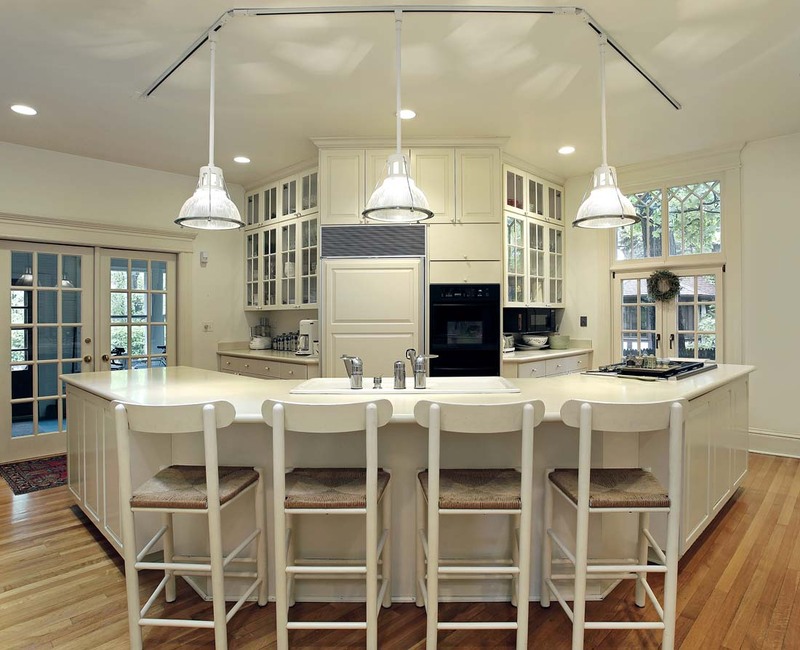 The number of island pendants that one kitchen should have is wholly dependent on the size of your kitchen island. There is no set rule for island sizes, but generally the smaller start at 24″ x 48″, while some go up to as many as 10′. For your buying convenience, we will start with smaller islands first and then move onto the more common sizes of six and eight feet. When placing pendant lights, consider the usable space that needs lighting first. Three 16″ dia. fixtures is more than enough to illuminate this custom 84″ breakfast bar. Does my kitchen need a single pendant? The 16.5″ Heirloom Scalloped Radial Shade Pendant Light is a great choice for a smaller island. It is rather large in diameter, which would light up a 24″ area easily. These pendant lights are great because they are wired for service with compact fluorescent and HID bulbs, creating a clean and bright kitchen area to work with. Pendant light fixtures can be ordered with accessories such as cast or wire guards. In addition, their shade design comes in multiple colors to match any color scheme in your home or professional kitchen area. These details can be handled when you call customer service to place your orders. Six and eight feet are common sizes for kitchen islands, but many people have trouble with placing the light fixtures. It is a good idea that if you’re willing to hang pendant lighting, then you’d want to divide your island into smaller sections and hang more than one pendant. For example, if your island is six feet long, you can easily divide it into two sections by hanging two pendant lights. You need to order larger light fixtures for such a situation, like the 14″ Heirloom Opal Shade Pendant Light, so that your kitchen island is well lit. While you’re searching for the right look, consider dividing your six foot or eight foot kitchen island into thirds and hang smaller pendant lights instead. For modern lighting, take a look at the 8″ x 7″ Prairie Barn Pendant Light. Look to pendants with warehouse shades and barnlights to add industrial design elements to your kitchen. These are the perfect match for those polished stainless steel kitchens that are popular today, especially if you have a metal or concrete-industrial kitchen island. Just divide your six foot island into three equal sections and hang one of our pendant lights in the direct center above each section. If you order with us, your cookery will be stylish and complete! Eight foot kitchen islands are a bit trickier, because you don’t want to divide them into threes – however, we offer the Topeka Ribbed Glass Antique Pendant Light just for this occasion. This pretty pendant light has a rustic feel to it and a sturdy 10″ glass shade – it even has an antique vintage key on the light itself and is still designed for control by a wall switch. 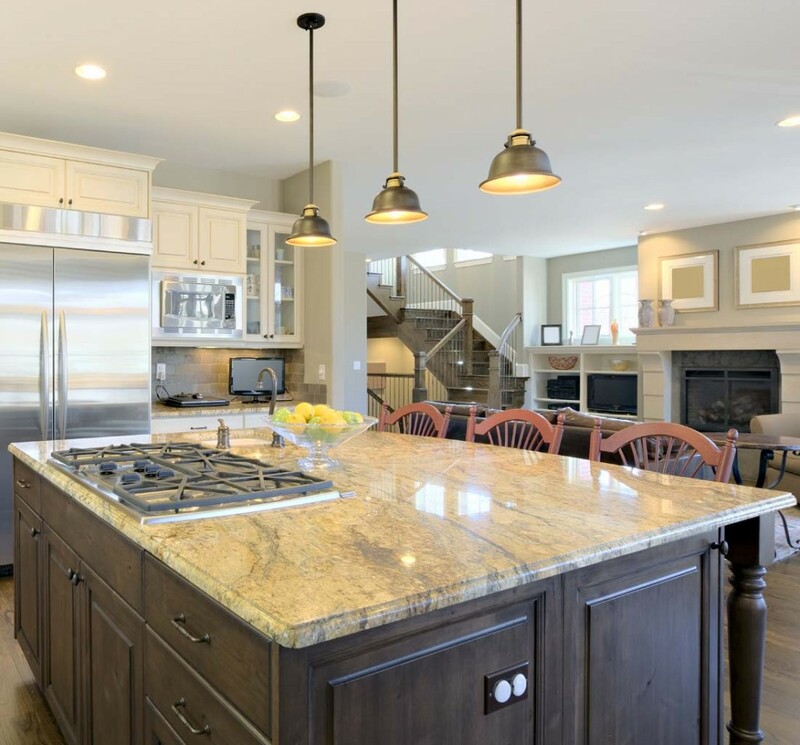 Once you get your kitchen island divided, make your lighting choices from our vast array of pendant lights, and get started remodeling today! July 7, 2014 /0 Comments/in Informational, Lighting Inspiration /by Lindsey P.
How many times have you walked into a washroom and thought, this looks strangely familiar? With the proliferation of the big box hardware store and DIY design and renovation, it’s not uncommon to see the same fixtures over and over again. Vanity lights are a prime example. The same four of five styles have been used for years. If you’re planning a design for a new bathroom, or remodeling an old one, consider trying something a little different like this line of ceramic bathroom lighting from Fabby Lighting. 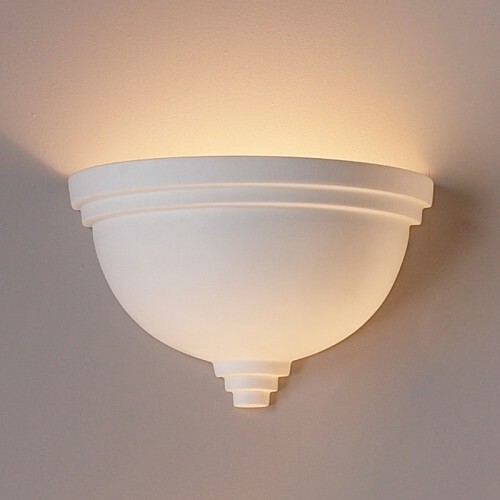 As with all Fabby products, these ceramic sconces are designed and manufactured in the USA. Each fixture is handcrafted by local artisans giving them an uncommon look sure to make your bathroom unique. Many designers choose a theme when decorating a bathroom. This often affects their choices of shower curtains, bathmats, and counter top accessories. With the variety of indoor light fixtures available from Fabby, there is no reason this theme shouldn’t be carried through to the vanity lights. Fabby Lighting makes hand-cut ceramic bathroom fixtures within reach. A seaside or beach theme is always a popular choice for a bathroom. Something about the turquoise waters and white sand of the Caribbean puts the mind at ease. The Floundering Fish Ceramic Vanity Light would be a great addition to any bathroom with a costal feeling. 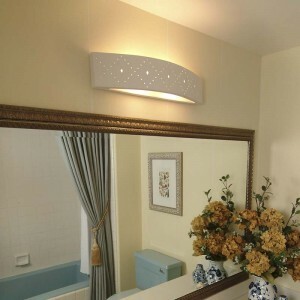 A great option for a children’s bathroom is the Island Star Gazing Light. Cutouts of swaying palm trees on deserted islands, watched over by the moon and stars are sure to have you smelling the salt air. If it’s a more modern look you’re after, the Rough Around the Edges Vanity Light may be the perfect choice. The open top and bottom design lets this fixture cast a unique silhouette on the bathroom wall. While it looks great as is with a natural off-white bisque finish, designers also have the option of painting it with any water-based paint to match the décor of the room. Of course not all homeowners are looking for a contemporary or whimsical beach feel in their bathrooms. For the traditionalist, a Classic Column Vanity Light is the perfect choice. The simple elegance of this style will add an instant touch of class to any bathroom. All of the two bulb ceramic sconces in this line are great choices when ordinary just won’t do. These original designs offer a balance between great form and excellent function that is hard to find in the average indoor light fixture. The next time you’re planning a bathroom design, be sure to consider ceramic bathroom lighting to add a touch of distinctive style to an often uninteresting room. Wallchieres offer a fresh approach to lighting, combining the vertical lines of a torchiere lamp and the wall-mounted convenience of a sconce. “Wallchiere” is the clever term for a wall-mounted lamp that resembles a free-standing torchiere lamp. Attached to a wall like a sconce, it usually has one of two functions: spreading light out or directing light upwards. Like a torchiere, it is usually tall and slender, like a torch. The Twigs Wallchiere has a vine shape that adds style to any decor. A wallchiere combines the best features of a wall sconce and a torchiere floor lamp. This combination of features can be advantageous. Choose a wallchiere instead of a torchiere if you want a light attached to the wall, and choose it over a wall sconce if you want soft shadows or upward lighting. A wallchiere is a good addition to a room that would otherwise lack intricate design. There are modern and vintage styled wallchieres available. Try the Dekora style two-lamp wallchiere for a perfect solution for any lighting dilemma. A wallchiere’s shade is often made of ceramic, as this material type is a good choice as a light diffuser. The Diploma style wallchiere is perfect for formal settings. Combine two with a dimmer for a perfect dining room experience. 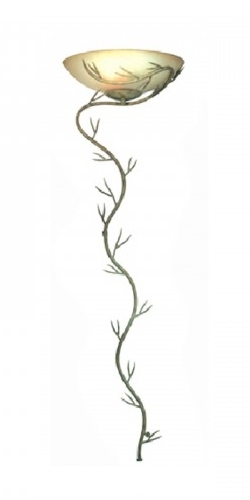 For a more traditional one-lamp experience, the Twigs style is a good choice. It wholly diffuses light, warming the atmosphere with the deep color of the lampshade. Keep an eye out for wallchieres with additional features. Our Studio and Gallery Style wallchieres include picture frames, so you know your beloved photos will get the spotlight they deserve. 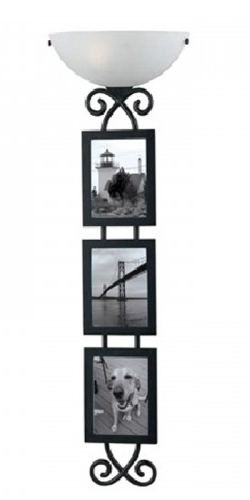 The Loft Wallchiere includes shelves, perfect for holding keepsakes or even books. 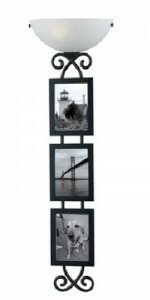 The Gallery Style Wallchiere holds three photos, as well. Where Should You Use a Wallchiere? Use a wallchiere wherever you would use a wall sconce. Convert a plain bathroom into a more fancy one by attaching small wallchieres near the vanity to warm up the view in the mirror. Add two wallchieres (with a dimmer) around a fireplace to focus attention on it. Dim the light to a level comparable to the fire to intensify the aesthetics of the heat. Instead of a corner torchiere, attach a wallchiere to all corners of a room to avoid pesky shadows and to allow space for furniture and decor. Use it instead of a corner wall sconce to direct light away from the middle, instead of towards it. This could come in handy when hosting an event with a larger audience. The diffused light will remove any unnecessary spotlight from individual people and avoid harsh glare. You can use wallchieres outdoors, too. Using a torchiere in an outdoor situation isn’t practical, and might be a liability because of wires and wind. Instead, attach a wallchiere to an outside patio — one that looks like a torch or a candle — to add more exotic flavor. They’re also dramatic on the façade of a retail business or restaurant. Wallchieres are relatively new on the design scene. Because of their versatility and fresh look, they should be a top choice when planning a room’s lighting. Clean, contemporary sconces can add dramatic light to any room. Consider pairing them on either side of a couch or bed. This traditional wall sconce resembles two candles. A wall sconce is a light fixture that is attached to a way that it only requires the wall for support. Wall sconces serve both aesthetic and utilitarian purposes. They are used very widely, and hallways, bathrooms, living rooms, and patios are among the countless places to add a wall sconce. There are various options to choose from when deciding to use a wall sconce. Some wall sconces have candles, while some are bulb based. Some are plugged into an outlet, while some are are battery operated. There are, of course, pros and cons for each different kind of wall sconce. Some look like lamps, with an arm coming out from the wall and an attractive shade. They are very traditional and suit most applications. Lamp style sconces work well with pull chains and switches. They use bulbs with shades that can project the light evenly throughout the room, especially if there are a lot of them set up in the room’s perimeter. Other, fancier wall sconces might have replaceable covers. Some people may want to be able to replace the design of the sconce without touching any of the circuitry or the light sources. Some sconces resemble torches or candles, providing a more natural feel. Homes and restaurants with patios and outdoor areas compliment the outdoor aspect of a torch-like sconce. Some sconces lie flat against the wall, with light seeping out around the edges, while others direct light up with a bowl shape. 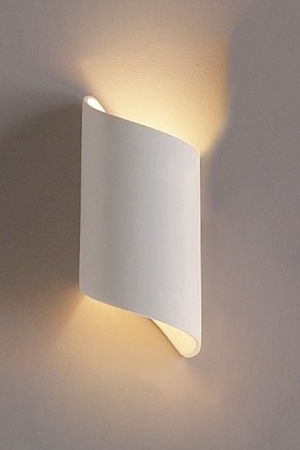 This ribbon wall sconce is made from ceramic and has a classic look. Sconces suit many different environments, including but not limited to offices, hallways, and indoor environments. Most sconces are wired to a switch, but there are some benefits to having battery-powered sconces. Unlike sconces that are hooked into your home’s wiring, battery-powered wall sconces can be more portable and may save energy. Also, a battery-operated sconce is much easier to install! Keeping a sconce separate from the room’s other light sources can be useful and stylish. It’s nice to be able to have light in just one area of the room as needed. When buying sconce lights, it is important to have an aesthetic goal in mind. Sconce size can impact the mood of the room, and have practical considerations as well. A two-bulb wall sconce could illuminate a room in less space than two separate one-bulb sconces. This can save space in a small room and avoid cluttering the walls. Wall sconces can be made of many different kinds of materials: Ceramic, plastic, glass, wood, and even metal. Choosing the right material for your situation is incredibly important to a room’s lighting. A blue ceramic sconce, for example, would highlight cool tones in a room, and a clear glass sconce could allow the warm light of the bulb inside to dominate the color emitted. Metal sconces offer defined, clear-cut shadows and focus light towards a certain area, while ceramic sconces dampen shadows and illuminate more spherically. Most designers combine overhead lighting, lamps, and wall lighting to create a rich atmosphere throughout a room. For help choosing sconces, call our design consultants at 1-888-320-0630. April 3, 2013 /2 Comments/in How To's, Informational, Lighting Inspiration /by Lindsey P.
Whether you want a simple media room or go for a complex home theater, these tips will get you started. 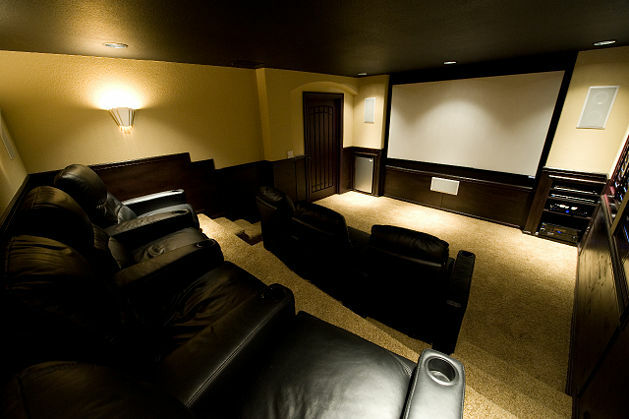 Are you thinking of turning your den, spare room, or even basement into a home movie theater? Taking on a media room project can be challenging, but with some planning, it’s within reach. The important elements are picture, sound, lighting, seating, and décor. Projectors with 1080p playback are becoming less and less costly. A good quality 1080p projector will cost around $1,000. The Epson PowerLight Home Cinema costs about $1,300 and does the job very well. 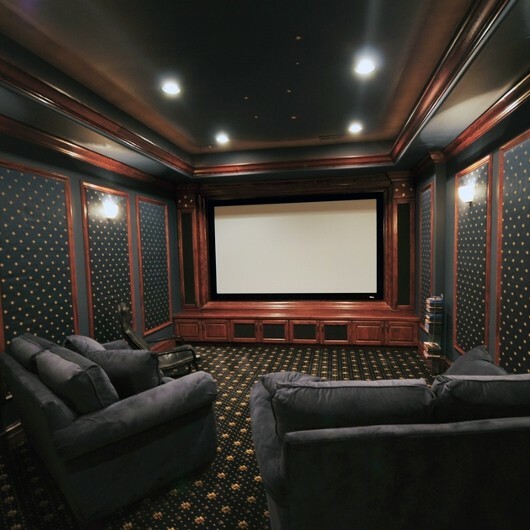 Higher end home theater projectors can cost up to $5,000 and more — your budget should determine how far you want to go when choosing a projector. It’s easy to find low- and high-end home theater projection systems at electronics stores and online. For the screen, you can either purchase a home theater screen or simply leave one wall painted white. A bare wall isn’t the best surface for showing movies, but if your budget is limited, it can work in a pinch. A 5.1 surround sound system is standard in a home theater system. I like the sound quality of Onkyo, because the highs and lows are pretty even. If your budget is a little higher, you might want to look into a 7.2 system. If you’re looking for a sound system with deeper lows, look into Bose. Bose is a bit more expensive than Onkyo, and its quality is arguably higher. The quality of a speaker system rises significantly with its price tag, and for good reason too. Sound is half the experience, and not-so-great sound quality can prevent a home theater room from feeling immersive and authentic. Theater sconces with dimming switches give a home theater authentic ambiance. In a real movie theater, the lights dim when the show begins. Use dimmers on your lights to make your home theater experience realistic. Slowly dim the lights to a very low brightness when the movie begins, to allow viewers’ eyes to adjust. Leave one dim light illuminated near the door to help viewers find their way to the restroom or other parts of your house in the middle of the showing. Your room will probably have some overhead lighting in the room already. 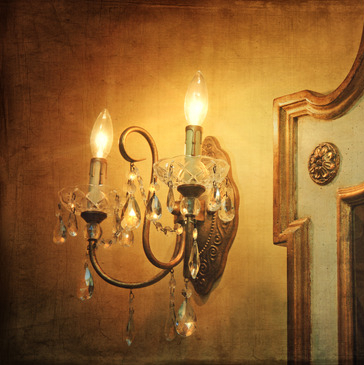 For a truly authentic theatrical look, add theater-style sconces along the walls. Bowl sconces will direct light towards the ceiling, so your viewers won’t be blinded by glare in their eyes. For those who place elegance at the top of their priorities, clean sconces with an opening at the bottom are a great idea. Not only do they project light up, they also reveal a path of more intense light below. Corner lights, on the other hand, aren’t a good idea, as the corners nearest to the screen could wash out the picture even if they’re very dim. Create rows of seating so everyone can enjoy the show. Image from wikiHow. Consider the size of the room, the size of your family, and the number of guests you’d like to invite over for screenings. If your home theater is just for you, you could go all out on a gorgeous, comfortable recliner. To entertain a few people, a couple loveseats should do the trick. To create a movie room that can accommodate larger groups, plan to have rows of chairs or, for a casual feel, beanbag seating. Ideally, row seating should be installed at different heights, just like in a real movie theater. The best theaters are the most comfortable ones, so investing in comfortable leather seating will pay dividends. If your budget allows it, look for reclining seats and cup holders. Use cool, dark colors to paint the walls. Dark blue, green, brown, and grey are all great choices. If you don’t want to invest money into a screen (which you should definitely do), you could leave one wall white. Avoid glossy paint to minimize glare and reflection, and allow viewers to focus clearly on the projected picture. Don’t forget the final touches: movie posters, memorabilia, and other keepsakes on the walls. Hang curtains around the screen and consider creating a “concession stand” with a small fridge for soda, some shelves for candy, and a popcorn maker for the most classic movie treat. Don’t forget to stock up with classic movies, because without them, none of these tips will matter! March 1, 2013 /0 Comments/in Informational /by Lindsey P.
When shopping for a dimmable bulb, check the packaging to make sure it can be dimmed. There are many different kinds of lights on the market today. Three of the most popular are Halogen, Florescent, and LED. Each of these three types of lights has its pros and cons. Some bulbs have better energy saving features while some bulbs will have stronger outputs. But can these bulbs be dimmed? Home, office, and even public environments often require different light levels at different times, and being able to identify the right bulb to use for different situations could save time, money, and embarrassment. 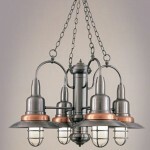 Not to mention add a touch of style to your home lighting. Here are the details on the new generation of energy-efficient dimmable bulbs. Can halogen bulbs be dimmed? Halogen is an incandescent lamp with a tungsten filament — similar to the regular incandescent we’ve all grown with. The bulb is filled with halogen gas (unlike the traditional incandescent). As the bulb heats up, tungsten from the filament evaporates through the halogen gas in the bulb and deposits on the inside of the glass “wall.” The halogen gas then carries those tungsten particles back to the filament and re-deposits them. For this reason, halogen bulbs often have much longer lives than regular traditional incandescent ones. All halogen bulbs can be dimmed, and finding a dimmer for halogen bulbs should be easy. Most dimmers are compatible with halogen bulbs. As long as the light and the dimmer are compatible, the bulb will be able to dim to most frequencies — but at the cost of a shorter life. 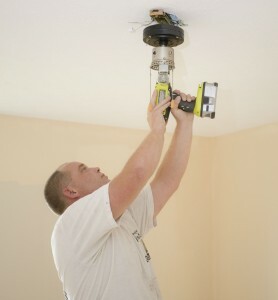 You will have to replace a dimmable halogen bulb more often, so keep that additional maintenance in mind. It’s easy to find an LED light bulb that can be dimmed. Most LED bulbs are dimmable. Can you dim LED bulbs? LED lights are a more recent invention; they use a lot less wattage than incandescent bulbs for the same amount of output. An LED bulb with comparable output to a 60-watt incandescent uses less than 8 watts — a huge power-saving improvement! 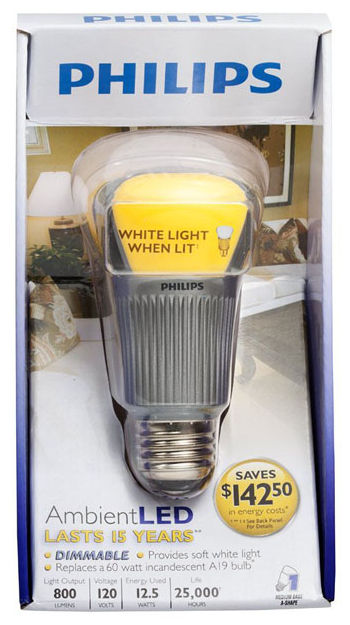 They are much more expensive than incandescent and florescent bulbs, but can last decades. An $80 LED bulb can last more than ten years and save tons of energy (and money) in the long run; a $7 incandescent bulb may last a fraction of the time and eat up much more power. In other words, your cost-per-year is much lower with a long-lasting LED bulb. Most LED bulbs can be dimmed. 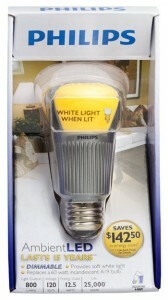 Simply check the packaging to verify its dimming capability. Some LED bulbs turn off at the lowest dimming setting; this seems to be less of an issue as LED technology improves through time. In order to maximize the quality of your LED lights’ dimming, look for dimmers that are made for LED’s. Fluorescent lights work with a constant electrical current flowing through ionized gas in a bulb. This is why they take a few minutes to turn on and brighten. For the same reason, most florescent lights, bulbs, and strips cannot be dimmed. But don’t despair! There are special florescent lights that can be dimmed. According to EnergyStar.gov, CFLs dim a bit differently than incandescents. They will dim to 10-40% of the light’s full brightness, but will not dim all the way to darkness. 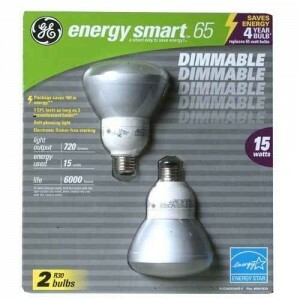 Dimmable fluorescent bulbs are expensive, and won’t work with traditional halogen dimmers. They require special florescent dimmers. To check if a florescent bulb is capable of dimming, a quick look at its packaging will often do the trick. 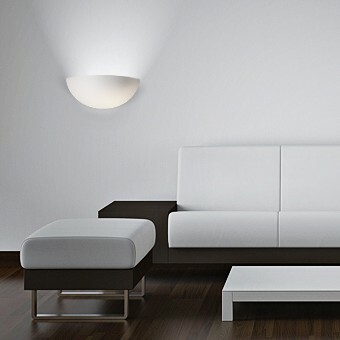 http://blog.fabby.com/wp-content/uploads/2013/03/dimmable-lights1.jpg 512 1024 Lindsey P. http://blog.fabby.com/wp-content/uploads/2016/12/logo.jpg Lindsey P.2013-03-01 19:28:032013-03-01 19:28:03Can Halogen, LED, and Fluorescent Bulbs be Dimmed?